MythBusters Part 2: WamBam Withholds Critical Info! The reality is that we have never hidden the fact that we manufacture in China. Every single box has always been identified as being “Designed in the USA, Made in China”. In fact, you can read a blog article that was published in May 2010 where we fully disclose this fact. We are proud of our long standing partnership with the leading manufacturer of vinyl fence in China. For well over a decade they have done a fantastic job in meeting all the ASTM standards for vinyl fence, and have successfully shipped thousands of containers into many highly respected fence installation and manufacturing companies across North America. That’s right. Thousands, not dozens. Our product design, quoting, marketing, sales, warehousing and shipping are handled by a fully qualified team of people working right here in North Carolina. At the end of the day, we manufacture in China for the same reason Apple does. When it’s done right, you, the consumer, get better value for your money. Just because something is made overseas does not automatically make it cheap. Your iPhone, iPad, and iMac are perfect examples of this. That being said however, we totally respect anyone who wants to purchase American Made products only. It’s a free country and like our friend Lee Greenwood sings….. God Bless the USA! Stay tuned for the final post in our MythBuster series next week! 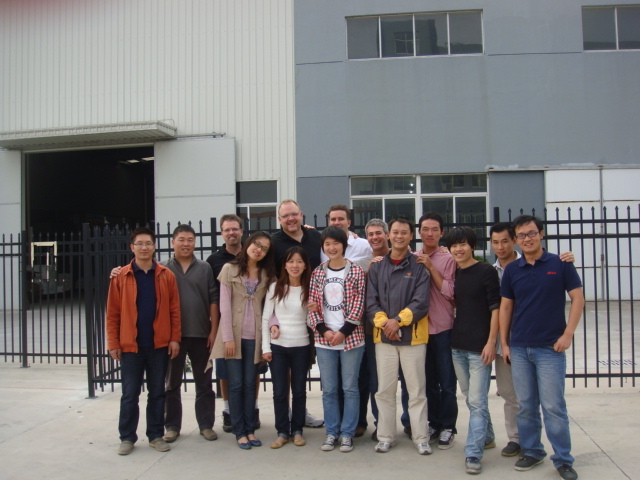 Some of our team at our factory in China. We are proud to be partnered with the largest manufacturer of fence in China!